This 12mm to -6 90º hose end converts your fuel line to -6. 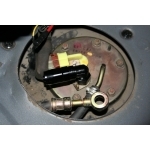 This fitting is perfect for those wanting to upgrade their fuel system to -6 line. The advantage to using this fitting is you will be able to keep the fuel pump cover, and will not have to cut it to be able tighten it down. Please check to see what type of fuel top hat you have. If you have a banjo fitting for the feed, then this fitting with work. If you have a steel hard line for the feed, then you will need our quick disconnect fitting. The Acura RSX, and newer Honda Civics have plastic fuel assemblies and these fittings will not work.